Heavy Duty Spade Bit Set, 6 pc. 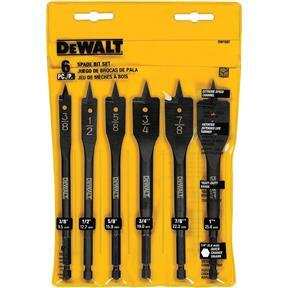 DeWalt DW1587 - Heavy Duty Spade Bit Set, 6 pc. All DeWalt spade bits are designed with cutting spurs for optimum hole finish, a hang hole for bit storage & wire pulling, full length heat treat for longer life, flats on shank to prevent slipping in chuck, 1/4" Quick Change shank which fits all drills, and 1/4" quick change holders. This set includes 3/8", 1/2", 5/8", 3/4", 7/8", and 1" drill bits.